The Houston Texans and Green Bay Packers comfortably made it through to the divisional round of the the playoffs. 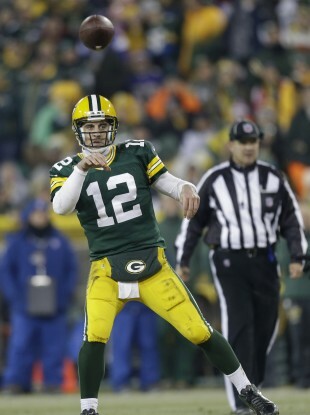 Aaron Rodgers won his first home playoff game on Saturday evening. THERE WERE SOME who felt both the Bengals and Vikings had a real chance of causing upsets on the road against the Texans and Packers respectively on Saturday night. However, the Bengals failed to create much in the way of offence early on and, indeed, only targeted star receiver AJ Green for the first time early in the second half. An interception on defence kept Cincinnati in the encounter but when Arian Foster ran in for a Texans’ touchdown with more than ten minutes to go in the third quarter, the game was as good as over. The win sets up a road trip to New England for Houston where they will take on the Patriots next weekend. In Saturday’s late game, the Vikings were forced to start former University of Alabama quarterback Joe Webb in place of the injured Christian Ponder. Webb, who hadn’t attempted a single pass all season, looked out of his depth early on despite many pundits predicting his option style offence would cause problems for a Packers outfit who were set up to deal with Ponder’s more predictable style. The win for the Packers was Aaraon Rodgers’ first in the postseason at Lambeau Field and Green Bay have been rewarded with a trip to San Francisco to play the 49ers in the Divisional round next weekend. Email “VIDEO: NFL Wild-Card Saturday highlights”. Feedback on “VIDEO: NFL Wild-Card Saturday highlights”.